Thousands of employees have protested Google’s involvement in a project using technology that could help target drone strikes. The protest reflects a culture clash that is likely to intensify as artificial intelligence is increasingly employed for military purposes. WASHINGTON — Thousands of Google employees, including dozens of senior engineers, have signed a letter protesting the company’s involvement in a Pentagon program that uses artificial intelligence to interpret video imagery and could be used to improve the targeting of drone strikes. That kind of idealistic stance, while certainly not shared by all Google employees, comes naturally to a company whose motto was once “Don’t be evil,” a phrase invoked in the protest letter. But it is distinctly foreign to Washington, D.C.’s massive defense industry and certainly to the Pentagon, where the defense secretary, Jim Mattis, has often said a central goal is to increase the “lethality” of the U.S. military. From its early days, Google has encouraged employees to speak out on issues involving the company. It provides internal message boards and social networks where workers challenge management and one another about the company’s products and policies. Recently, the heated debate around Google’s efforts to create a more diverse workforce spilled out into the open. The company subsequently described its work on Project Maven as “non-offensive” in nature, though the Pentagon’s video analysis is routinely used in counterinsurgency and counterterrorism operations, and Defense Department publications make clear that the project supports those operations. Both Google and the Pentagon said the company’s products would not create an autonomous weapons system that could fire without a human operator, a much-debated possibility using artificial intelligence. But improved analysis of drone video could be used to pick out human targets for strikes, while also better identifying civilians to reduce the accidental killing of innocent people. 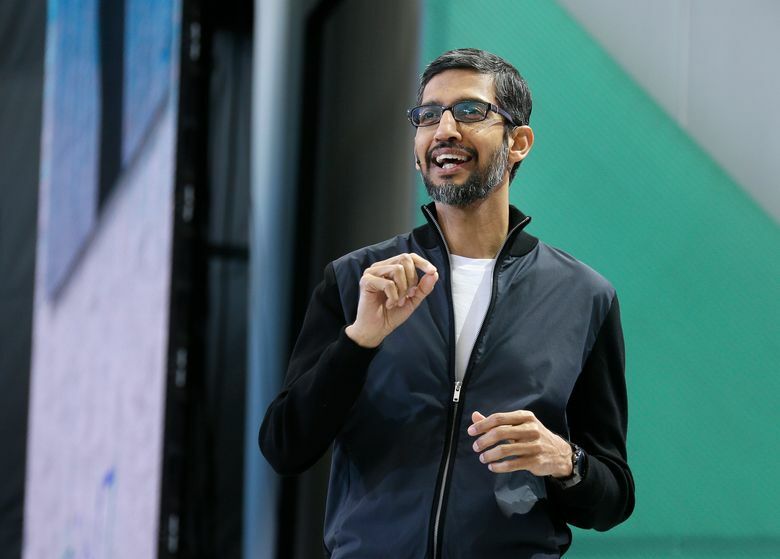 Without referring directly to the letter to Pichai, Google said in a statement Tuesday that “any military use of machine learning naturally raises valid concerns.” It added, “We’re actively engaged across the company in a comprehensive discussion of this important topic.” The company called such exchanges “hugely important and beneficial,” though several Google employees familiar with the letter would speak of it only on the condition of anonymity, saying they were concerned about retaliation. The statement said the company’s part of Project Maven was “specifically scoped to be for non-offensive purposes,” though officials declined to make available the relevant contract language. The Defense Department said that because Google is a subcontractor on Project Maven to the prime contractor, ECS Federal, it could not provide either the amount or the language of Google’s contract. ECS Federal did not respond to inquiries. An uneasiness about military contracts among a small fraction of Google’s more than 70,000 employees may not pose a major obstacle to the company’s growth. But in the rarefied area of artificial intelligence research, Google is engaged in intense competition with other tech companies for the most talented people, so recruiters could be hampered if some candidates are put off by Google’s defense connections. As Google defends its contracts from internal dissent, its competitors have not been shy about publicizing their own work on defense projects. Amazon touts its image recognition work with the Department of Defense, and Microsoft has promoted the fact that its cloud technology won a contract to handle classified information for every branch of the military and defense agencies. The current dispute, first reported by Gizmodo, is focused on Project Maven, which began last year as a pilot program to find ways to speed up the military application of the latest AI technology. It is expected to cost less than $70 million in its first year, according to a Pentagon spokeswoman. But the signers of the letter at Google clearly hope to discourage the company from entering into far larger Pentagon contracts as the defense applications of artificial intelligence grow. Google is widely expected to compete with other tech giants, including Amazon and Microsoft, for a multiyear, multibillion-dollar contract to provide cloud services to the Defense Department. John Gibson, the department’s chief management officer, said last month that the Joint Enterprise Defense Infrastructure Cloud procurement program was in part designed to “increase lethality and readiness,” underscoring the difficulty of separating software, cloud and related services from the actual business of war.